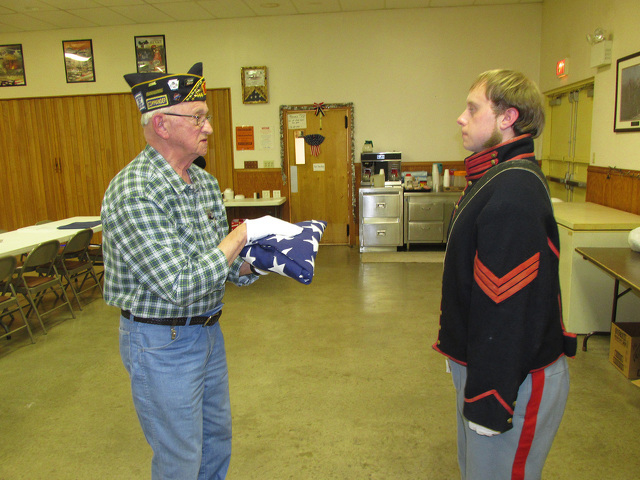 Millheim Civil War reenactor and historian Jimmy Brown recently was presented with a folded American flag in honor of his great-grandfather, Lewis “Alfred” Crader, a veteran of World War I. Members of Millheim American Legion Post 444 made the presentation. According to Brown, Crader, of Spring Mills, was drafted into the army in September 1917. He received basic training at Fort Hancock in Georgia, then was sent overseas in May 1918. He served in the 28th Division, 111th Infantry, and was severely wounded in action near Rheims, France, in August 1918. Crader underwent medical treatment for 15 months, then was given a medical discharge from the Army. His wounds qualified him for a Purple Heart medal, but a bureaucratic slip-up prevented him from receiving the medal until 50 years later, with the help of the Boalsburg chapter of the Military Order of the Purple Heart. At the ceremony, Brown showed some artifacts from Crader’s service, including his gas mask, a bayonet, a painted helmet known as “trench art” and other items. Brown said it is documented that his great-grandfather’s unit was gassed while fighting in the trenches. Brown shared a photo of Crader’s pocket-sized copy of the New Testament, which stopped a piece of shrapnel, and a copy of the telegram sent to Crader’s parents informing them he had been wounded in action. American Legion members folded the flag according to the 13-fold protocol, then Post Commander Ken Royer presented the flag to Brown. 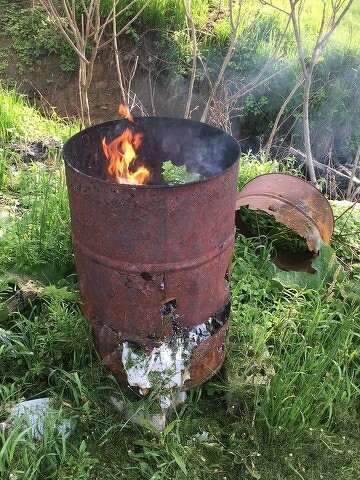 Burning trash in the backyard has long been known to cause air quality concerns, but a recent Penn State study sponsored by the Centre County Recycling and Refuse Authority has found that the longtime practice of burning trash also puts harmful toxins in the soil.